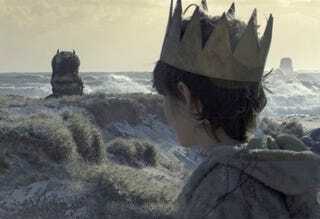 Yesterday morning, audiences at Comic-Con saw a lengthy series of clips from the forthcoming Where the Wild Things are adaptation from director Spike Jonze. Introduced by young star Max Records, the movie promises to be gorgeous, but maybe too hip. Records began by telling us that he'd recently spoken with Maurice Sendak, author of the beloved kids' book the movie is based on. Sendak apprently told Records, "I hope people like this movie because if not they can all go straight to hell." In the footage we saw, which included interviews with Sendak as well as writer Dave Eggers (who co-authored the screenplay) and Jonze, it was clear Sendak's approval and vision were central to the filmmaking. The author called Eggers and Jonze "throwbacks, like people I knew in the 1960s." He approves of what Jonze calls "refanging" the movie, and "making it dangerous." According to Records, Jonze took the idea of making the movie dangerous fairly literally. He kept a propane tank on the set, and would shoot giant flames out of it near Records when he wanted to get a reaction of genuine surprise. As for the clips themselves, they were set to a series of creamy, twangy indie rock songs that made it feel like it was aimed at adults who came of age in the 1990s wishing their suburban lives were as wild as the music they listened to. The imagery was simply beautiful, which isn't surprising given that director Jonze is known for his surreal, playful concept design in movies like Being John Malkovich and Adaptation. Jonze got the emotional tenor just right in a scene where Max plays with the giant, furry monsters, finding himself at the bottom of a soft pile of them as they fall into snoring slumber. He confesses to one sleepy monster that he hates his home, and that's why he's come to their island. It's a simple, strange scene, but it did such an incredible job capturing the fierce loneliness of childhood that it left some audience members sniffling. The world of the monsters is sad and luminous, filled with bright blue oceans and glowing beaches. We saw another scene where Max directs the monsters to build a castle out of rocks, reeds, sticks, and flowers. The end result looks sort of like a Death Star made of woven branches and flowers, and it's breathtaking. One possible flaw is that the film seems a bit too taken with its vision, and the scenes verged a few times on becoming precious. Co-author Eggers has made a career out of hip preciousness, and it's obvious that his style has influenced the film - it's the kind of thing urban alterna-parents will want to take their kids to see. But it's hard to tell how the tone will work throughout the film from just a few minutes of clips. Seen in context, these scenes may not feel trapped in hipster sentimentality. The filmmakers have tried to make a movie that is true to the experience of childhood, and the original book, by avoiding cutsie cliches. Though what we saw was promising, it's still too early to tell whether the movie has fangs.